Sgt. Reckless learning her job. What is it about some dogs, cats and horses that sets them apart? Some seem to have a sixth sense and then, something else that makes them almost human. Is it personality, a character trait or a quirk that they have developed that endears them to us? In the case of a little mare named Reckless it was all of the above and then some. Reckless was the ultimate war horse and she seemed to understand that her job was more than carrying ammunition, supplies, telephone wire and the wounded; she recognized that she was also the ultimate spirit booster for her boys. 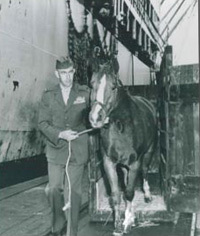 Reckless was in the United States Marine Corps, an unusual job for a horse but in this case it was the perfect job for a very unusual horse. And while much has been written about this little mare, events have recently unfolded to ensure that she will never, ever be forgotten! Reckless who stood around 14.1h.h. (and was therefore technically a pony,) was bought for $250 from a young boy Kim Huk Moon at the race track in Seoul, South Korea. He desperately needed money to buy his sister an artificial leg when hers was blown off in a mine accident. He loved his horse Ah-Chim-Hai (translated to “Flame of the Morning”) but he loved his sister enough to make this sacrifice. His decision created history. Reckless was bought in 1952 by Lieutenant Eric Pedersen, commanding officer of the Recoilless Rifle Platoon, Antitank Company, Fifth Marine Regiment with his own money. He needed a way to carry ammunition to the front lines for the 75mm Recoilless Rifle Platoon during the Korean War that raged from June 25, 1950 – July 27, 1953. Not only was she expected to march right into battle, she was often a walking bomb herself with the ammo strapped to her. Reckless loved a beer with the boys. Reckless was given other jobs too and these included laying communications wire, a task that she excelled at laying out more lines in one day than a dozen men could. She also carried grenades, small-arms ammunition, rations, sleeping bags, and even barbed wire. But, this wasn’t just a one-time trek. Reckless did it over and over without putting a hoof wrong; in fact she did it 51 times over a five day period and 95% of the time she was alone. In all she carried 386 rounds of ammunition totalling 9,000 pounds which equals almost 5 tons. She also shielded four Marines from enemy fire, carried the wounded and, when she was wounded herself, she kept on going. Reckless also liked the taste of chocolate bars, hard candy, shredded wheat, peanut butter sandwiches and mashed potatoes. She drank beer and cola, and sometimes a little whiskey or bourbon but Latham who had grown up with horses was careful of what the adoring marines fed her. She had free rein of the camp after she decided living in a bunker didn’t suit her and on rough nights she often slept in the tents with the men; they just moved their sleeping bags over and she stretched out nearby. Reckless arriving to the USA from her Korean duty. After the war the Lt Col Geer wrote a letter to Headquarters, U.S. Marine Corps requesting that Reckless be brought back to the USA. The answer he got stated that she was not Government property so government funds would not be allocated. Luckily, Stan Coppel, the executive vice-president of Pacific Transport Lines, had read about Reckless in The Saturday Evening Post article and he offered to have her brought back on one of his ships from Yokohama to San Francisco free of charge. Apparently after the article, the American public were outraged that one of their “marines” would be left behind so this may have spurred on Coppel! Reckless lived at Camp Pendelton and though she became the property of the First Marine Division Association, but she was cared for by the 5th Marines. On August 31, 1959 she was promoted to Staff Sergeant by General Randolph Pate, the Commandant of the entire Marine Corps: 1700 troops marched past her and there was a 19 gun salute to honour her. In 1955 she appeared on the very popular Art Linkletter show, and over the years walked in parades and made celebrity appearances. In 1971 Reckless was again honored when the First Marine Division Association erected a memorial at the entrance to the base stables. On Nov. 10, 1989, the first race at Aqueduct, NY was named “The Sgt Reckless” through the efforts of former Marine Charlie Murphy, who worked at the track, and Bruce Lombardi, secretary of the New York Racing Association. In 1990 Life Magazine created a special edition listing the 100 all-time greatest heroes and Reckless was on that list. Then, as so often happens, the little mare faded into obscurity. Even four years ago there were only a handful of websites that mentioned her. That is when California movie writer and producer Robin Hutton chanced to come across the story of Reckless. She was looking for some inspiration for a series pilot on horse racing and perhaps it was fate or luck that brought her and Reckless together. She was smitten with the story titled Sergeant Reckless – The Mighty Marine that she found in her Chicken Soup for the Horse Lover’s Soul. The story was actually focused on the birth of Reckless’s first colt but she says that the description of the little mare’s antics had her laughing and she wondered why she had never heard of this horse before? However a documentary and a book were just the start. Hutton helped get support for a memorial to Sgt. Reckless that is scheduled to open in July 26, 2013 at the National Museum of the Marine Corps in Triangle, Va. near the Marine Corps base in Quantico, Va. It will include a statue in Semper Fidelis Memorial Park next to the museum and an exhibition of items, including one of Sgt. Reckless’s horseshoes and photographs. Everybody is welcome. 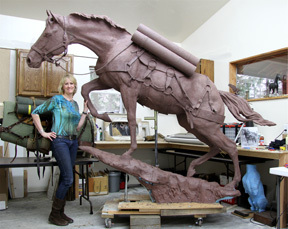 Artist Jocelyn Russell with her Reckless statue. 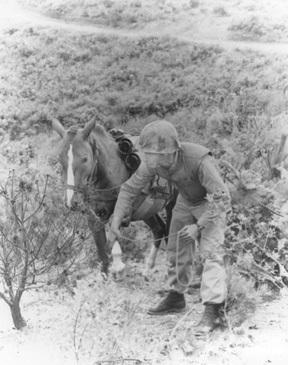 The statue of Reckless was created by Jocelyn Russell and it shows the determination in the eyes of this game little mare as she carries heavy ammunition up a steep track. But, while her eyes show heart and grit, there is also kindness there. 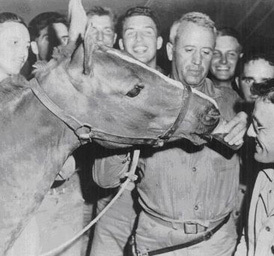 Sergeant Reckless won many awards including: two Purple Hearts, a Presidential Unit Citation with star, Good Conduct Medal, United Nations Service Medal, National Defense Service Medal, Korean Service Medal, Navy Unit Commendation, and Republic of Korea Presidential Unit Citation. She wore her Purple Hearts and a multitude of others on her scarlet and gold ceremonial blanket when she was making appearances. Reckless died in May 1968 and it seemed as if she might become another forgotten hero. However, fate intervened and in July 2013 in a beautiful shady forest at Semper Fidelis Memorial Park in Quentico, Virginia we will honour the Reckless courage, spirit and determination. In doing so we will say a heartfelt thanks for the many lives she saved and the many men she inspired over 60 years ago. We would like to thank Cindy for including us in her blog and that we’re proud to be part of this tribute to a true war hero. Sgt. Reckless where ever you are…may you always have green grass, a shady tree and cool water, you’ve earned it girl. And this video depicts a graphic portrayal of her war experience. in Korea, and helped care for Reckless upon arrival to the U.S.A. Sgt. Lively is in the picture with the group and Reckless and also pictured in the book. We want to locate the Life magazine that Reckless appeared in as one of the 100 Hereo. Sgt. Lively retired from the Marines after 32 years service time. My Father was Sgt. Elmer C. Lively. A proud warrior and a loving father.